A group of U.S. 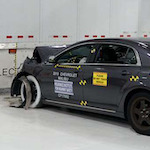 Senators and members of the House this week reintroduced legislation that would mandate side underride guards on tractor-trailers to help mitigate impacts on car occupants in crashes where the car slides under the trailer. The legislation was first introduced in December 2017, but no action was taken. The bill, dubbed the Stop Underrides Act, would require underride guards on the sides and front of a truck and would update the standards for underrides on the back of trailers. It would also add underride guards as part of the required annual inspections for trucks and require the Department of Transportation to review underride standards every five years. The legislation was introduced by Senators Kirsten Gillibrand (D-New York) and Marco Rubio (R-Florida) and Representatives Steve Cohen (D-Tennessee) and Mark DeSaulnier (R-California). The full text of the bill has not yet been released, so it is unclear if it would require the side underride guards on only new trailers, or if it would also require existing trailers to be retrofitted with the devices. A 2017 study by the Insurance Institute for Highway Safety found that side underride guards offer similar safety benefits as rear-mounted guards. IIHS said in its report that in 2015, 301 people died in crashes in which a passenger car struck the side of a tractor-trailer. The group determined that rigid side underride guards could reduce injury risk in about 75 percent of side-trailer crashes. The Owner-Operator Independent Drivers Association came out in opposition to the legislation when it was originally introduced. The American Trucking Associations was also opposed in 2017 to requiring the devices. “For example, side underride guards would add significant weight and require stiffer trailers which can develop cracks in the frame rails during normal operation – wearing out sooner and creating a safety issue of potential trailer failure during operation,” the organization said through in a statement to CCJ in May 2017. A number of groups, including the Commercial Vehicle Safety Alliance and the Truck Safety Coalition, support the legislation. Solving the problem of distracted driving within the U.S.